Remember Charles Lewton-Brain's fold forming metal technique? (See first two links below). He invented a totally new way of forming and adding texture to metal sheets. It might be daunting to make bigger pieces. 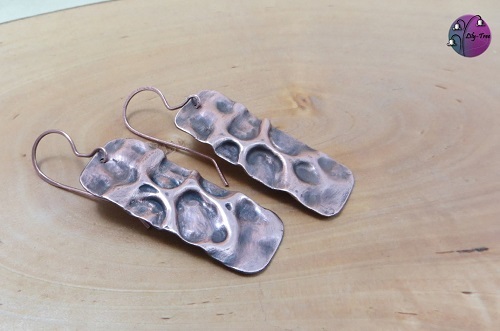 But check out Lily-Tree's air chased copper earrings tutorial. Chasing metal involves the hammering of a metal sheet to introduce raised and depressed sections. You can see why fold forming is sometimes referred to as air chasing because the chasing is done on a folded piece of metal and there is air in between the two layers! Note that this technique requires the torch to anneal (soften) the metal during the process. All that hammering work hardens the metal so you have to soften it from time to time. The instructor adapted the fold forming technique. She even used duct tape at one point when she was flattening the final piece. She also assumes you know how to use liver of sulfur to patinate the copper. You know I love working with copper. It's an affordable metal that looks great in jewelry and ages beautifully. Air chasing is something that is lots of fun. Some people are afraid to try it but once you start you realize it's not hard at all. I'd wear these earrings in a heartbeat because they are unique and would stand out from the churned out earrings we see everywhere. Totally agree! I think it is quite therapeutic to hammer away too. You will have to order in the metal sheets from a jewelry supplier!